We often hear about how running is “all about the hips”, and how the source of all your running injuries is weakness in the muscles around your hips, but what does that mean? 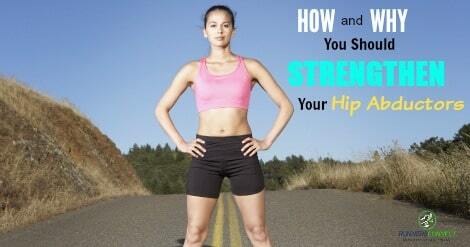 Which hip muscles are so critical to success as a runner? Turns out your hip adductor and abductor muscles are a huge part of you being able to stay healthy as a runner, and if they are neglected, you are putting yourself at serious risk of an injury. We are here to show you why this is the case, and what you need to do to make sure your hip abductors are strong to prevent future issues. In the article Proper Running Form: Does Gravity Help You Run Faster?, we considered the importance of hip extension in running, and noted that in cases of runners with restricted mobility in the front of the hips (e.g. tight Quads and/or Psoas), we often see a forward drop of the pelvis, highlighted by an increase in the curve of the lower back. In other words, the body succeeds in traveling over the supporting leg, but without making optimum use of the powerful Gluteus maximus (the main muscle of the buttock). As a result, stride length becomes compromised, propulsion is reduced, overall effectiveness of the running gait cycle is inhibited and risk of injury potentially raised. This week’s article focuses on a smaller but equally important member of the glute family – the Gluteus medium. We are going to show you why the gluteus medius is important, and give you the best hip (and glute) strengthening exercises for runners that will help to stop your hip drop and keep you healthy. No more of those tight hips! Ready to get started? What is the Gluteus Medius and Why is it Important? As can be seen in the image to the right (posterior view), the Gluteus medius or iginates at the dorsal ilium (uppermost, largest bone of the pelvis) below the iliac crest and inserts at the top outside surfaces of the greater trochanter (top of the thigh bone). It is the major abductor of the thigh (moves the leg away from the midline of the body). The anterior fibers rotate the hip internally and the posterior fibers rotate the hip externally. Whilst the Gluteus maximus is a hip extensor (moves your leg behind you) and is involved in the forwards & backwards tilting of the pelvis (dynamic stabilization in thesagittal plane), the Glute medius is a hip abductor (moves the leg out to the side) that plays a major role in controlling the sideways tilting of the pelvis. The Trendelenburg gait is exhibited by a person who through weakness in the abductor muscles, cannot maintain sufficient height of the opposite side of the pelvis to raise the foot and transfer weight to the other leg. 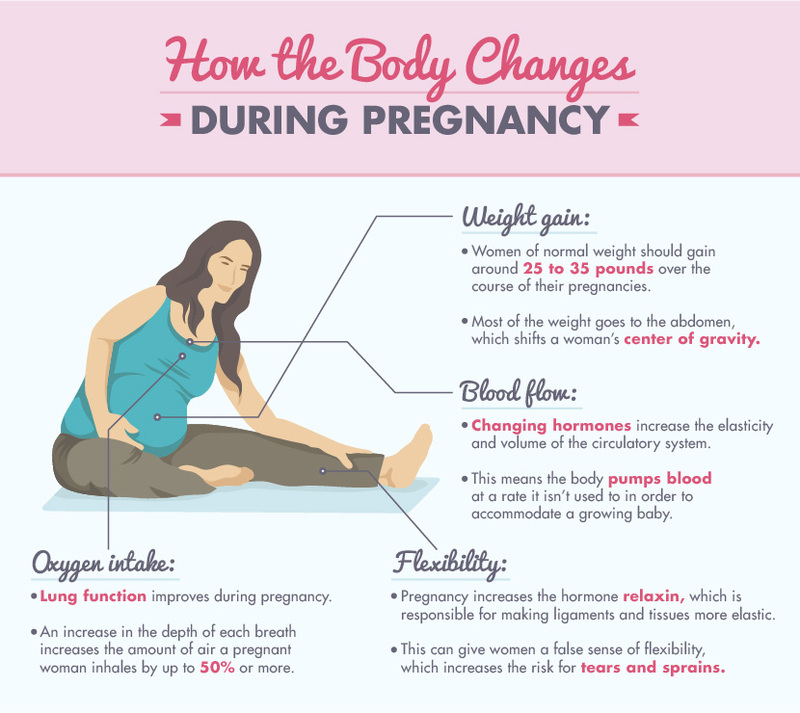 Instead, the pelvis drops downwards, meaning the affected person has to bend their leg more than usual at the knee in order to make up for the lack of lift. To compensate, the stride on the unaffected side typically becomes shorter, along with a tendency for the person to lurch towards the weakened side in an attempt to maintain a level pelvis. The term hip drop has become increasingly popular in articles today. It seems almost every runner has some level of it, and what does that even mean anyway? In the diagram below, the drawings (A) and (B) illustrate a runner in left leg “swing phase”, meaning the left leg is off the ground and in the process of travelling forwards. The right leg is in mid-stance directly under the hips and taking maximum load as the body weight passes over it. The Gluteus medius is highlighted as the dark area on the right hip. In image (A), the Gluteus medius is performing its role of dynamically stabilizing the pelvis such that the left hip does not drop more than 5 degrees (the image shows a straight line but in reality 4-5 degrees is regarded as the range necessary for minimizing vertical displacement of the body’s centre of gravity). However, image (B) shows a weaker Gluteus medius not fulfilling its role and in effect allowing a marked drop (more than 5 degrees) of the left hip. The photo to the right of the drawings shows this same scenario for a real life runner. 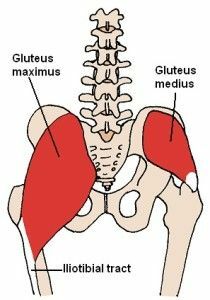 What Does a Weak Gluteus Medius do? In a study by Fredericson et al (2000), 24 distance runners with Iliotibial Band Syndrome had the hip abductor strength of their injured limb compared to that of the non injured limb (and to that of a control group). It was found that on average Gluteus medius strength was 2% less on the injured side. After a six-week rehabilitation period with particular focus on strengthening the Gluteus medius (side-lying hip abduction and pelvic drops), 22 of the 24 injured athletes were pain-free and able to return to running. Furthermore, a six-month follow-up showed no reports of recurrence. Other studies have also linked weaker hip abductors and external rotators to Patellofemoral Pain Syndrome (Ireland et al.,2003; Robinson et al.,2007; Cichanowski et al.,2007). How do I strengthen my gluteus medius? Given the body’s remarkable ability to find and adopt a compensatory movement pattern when faced with weakness or dysfunction, it is very important to use a gradual,progressive exercise program when attempting to strengthen and stimulate use of a weak muscle/muscle group. 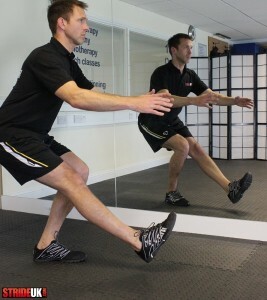 Though in recent years much attention has been given to the importance of “functional” exercise (i.e. one that mimics as much as possible the dynamic movement we are aiming to achieve), experience shows that giving the body too complex a movement pattern too soon can often hinder or prevent recruitment of the target muscle/muscle group. Studies that quantify the electromyographic activity (EMG) of the Gluteus medius during common therapeutic rehabilitation also seem to support the use of exercises that some would dismiss as not “functional” enough. 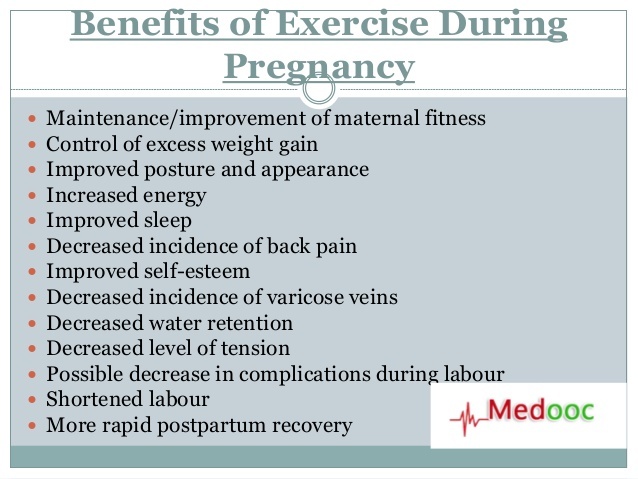 In the table below, collated values are shown for exercises that scored significantly in three such studies: Bolgla et al.,(2004), DiStefano et al.,(2009) and Boren et al.,(2011). Other studies have been done including research for exercises not included in the three studies above (Ayotte et al.,2007; Krause et al.’2009; Philippon et al., 2011) but none of them weaken the relevance of the data in the table. It is worth pointing out that the variance in results may be due to the technique used in execution of each exercise. Which exercise/s you do will depend on your individual circumstances, needs and goals, all of which should be considered by a professional before you start a new program. For example, although single-leg squats score the highest MVIC% in the table, they may not be appropriate for you at this moment in time if you are suffering from a patellar tendonitis. 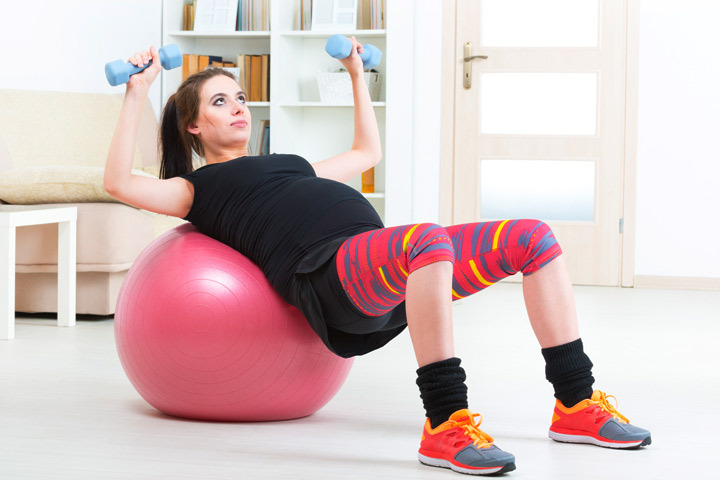 All exercises can and should be regressed/progressed according to your personal fitness level. As always, if in any doubt, consult a suitably qualified health professional. 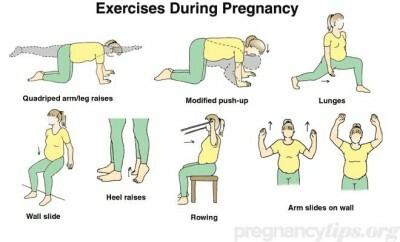 What are the five exercises listed in the table? We will describe them here, but the number of repetitions, sets, tempo and breathing patterns given serve as examples only, and may need modifying to suit individual needs & goals. The exercise is initiated by moving your backside backwards and downwards, as opposed to moving the knee of your supporting leg forwards. This can be challenging for many people as it requires a certain level of balance, coordination and flexibility. For this reason, the single-leg squat is often placed higher up on the ladder of exercise progression. Attempting it too early will often mean you resorting to moving your knee forwards, which in my opinion reduces recruitment of the glute muscles and puts more stress on the quadriceps muscles and knees. In order to encourage initiation of the exercise with a backwards shift, I often recommend clients place a suitably heighted chair behind them to give them a target and confidence in the fact that if they do lose stability they will not be falling onto a hard floor. If you are moving backwards, the natural position for the non-weight bearing leg will be in front of you as opposed to behind (see photo). As your strength and balance improves, you can progress by lowering the height of the object behind you. Whilst the edge of your bed may be a good place to start, it may well not be long until you are using the seat of the toilet as your goal. 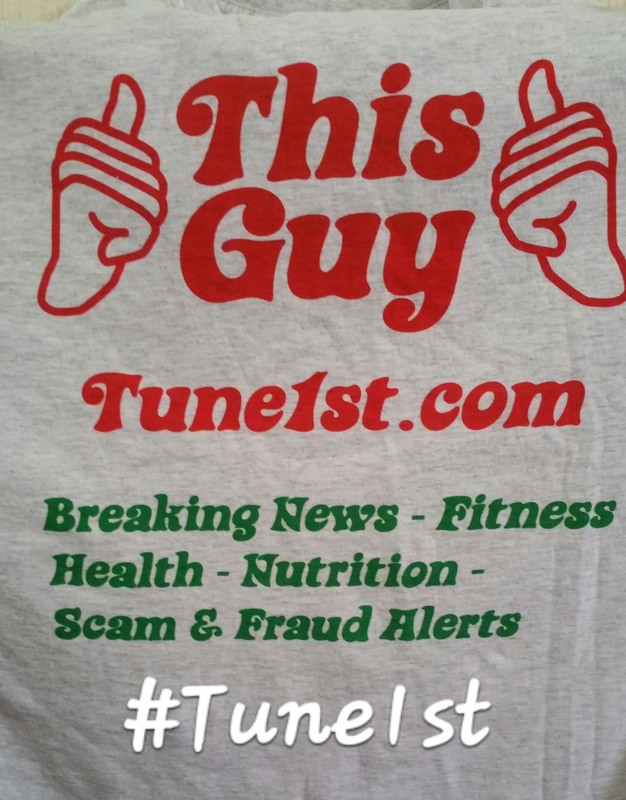 Number of sets: 1 on weaker leg (if applicable), 1 on stronger leg, 1 again on weaker leg. Lie down in a left side-lying position. Make sure your hips are “stacked” (right hip directly over the left hip) and that your body is in a straight line. Placing your top hand on the floor in front of you can help ensure that you are not leaning forwards. Your pelvis should be in a neutral position (not hitched or tilted forwards/backwards). Though performance tempo can vary according to the goal, I typically have a client move accelerate when moving away from gravity, and decelerate when moving in the same direction as gravity. In the case of this exercise therefore, I would take 1 second to lift the top leg up (breathing out), 2 seconds to hold it in top position (keep breathing out) and then 3 seconds to slowly return it to start position (slowly breathing in). The position of the heel can be varied according to goals, but as a starter I typically encourage the heel to remain the same height as the toes throughout. Number of sets: 1 with weaker side (if applicable), 1 with stronger side, 1 again with weaker side. The single-leg deadlift can be performed in various ways but essentially your aim is to hinge forwards and reach your hands towards the ground whilst keeping your shoulders back, your back straight, and your supporting leg as straight as possible. From here you return back up and then repeat. 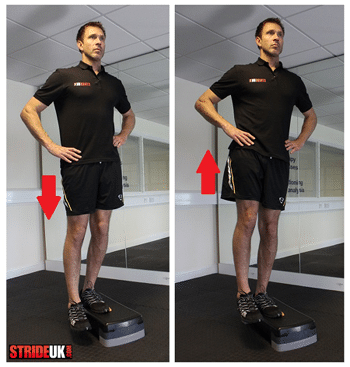 In some versions of this exercise, the non-weight bearing leg is lifted to become as close as parallel to the ground as possible. (I kind of wish I had done this now in the photo – would have looked far more impressive!). 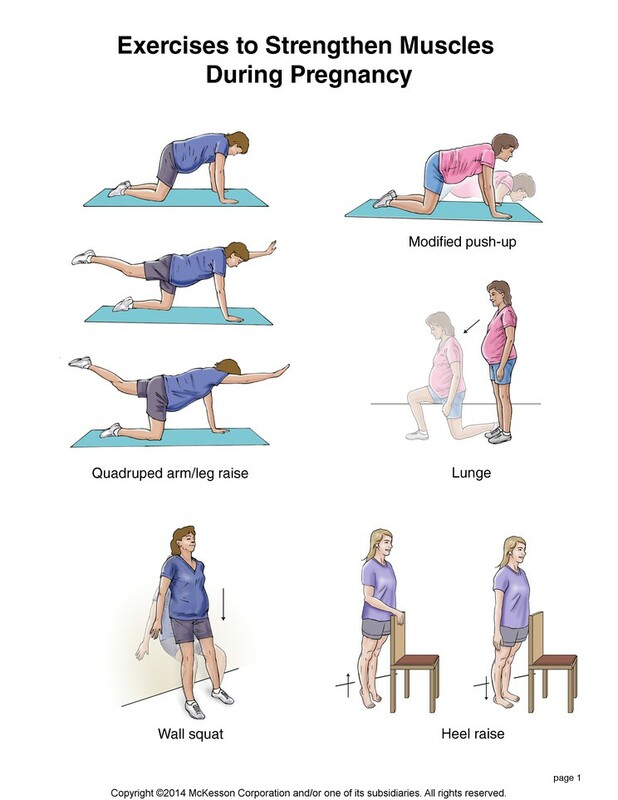 Progression can involve using weights and/or performing the exercise on a less stable surface. Rotation is also often added to help encourage alignment of the hips. As well as strengthening the Glutes, single-leg deadlifts can also be an excellent exercise for the hamstrings. Hip drops, also referred to as pelvic drops, in effect mimic the hip drop we saw can happen during running if the Gluteus medius is not functioning optimally. 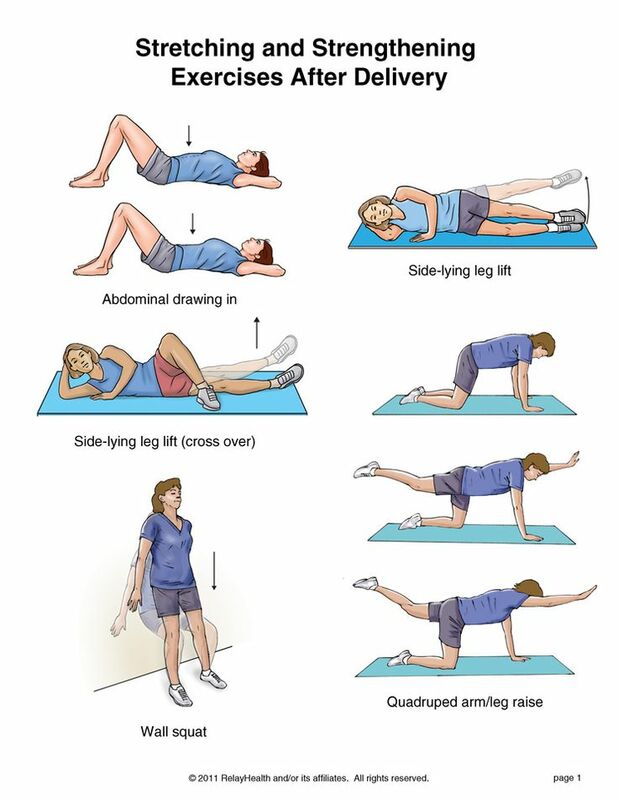 Throughout this exercise, the supporting leg needs to remain straight as all movement needs to be a product of lifting and lowering the hip on the opposite side. The body will typically “cheat” on the way down by bending the supporting knee (instead of lowering the opposite hip) and “cheat” on the way up by raising the shoulder (instead of lifting the hip). 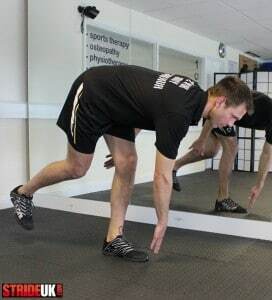 As is the case in all the exercises, try to avoid allowing the pelvis to rotate forwards or backwards. All exercises typically require quality of movement to achieve goals but this exercise in particular often falls prey to the body finding alternative ways to getting the job done. The Clam is typically slandered by advocates of “functional training” but as we have seen research does show they should be considered depending on the needs of the client. I also find them a wonderful way to discover strength imbalances between the two hips. In side-lying position, slide your bent legs forward so that your hips are flexed to approximately 30 degrees (other versions of the exercise use different angles). Making sure your hips are “stacked” and (apart from your knees) the rest of your body is in a straight line, open your knees while keeping your heels together and pelvis in a neutral position (not hitched or tilted forwards/backwards). Placing your hand on the side of the hip should help you feel the Gluteus Medius contracting as the legs open. I will finish by reiterating that selection of exercise needs to be based on factors, hence the need for therapists & trainers to treat the body in front of them as opposed to what they have read in a book. As a performer of exercise, it is vital to follow a progressive program and take time to listen to the body. The research we have looked at does serve to remind us, however, that in a world where information is so quickly gained & shared, many exercises being prescribed today do run the risk of being too complicated. The five exercises we have looked at should not be overlooked because of their age or simplicity. All the evidence suggests that the hip abductors play a very important role in running performance and injury avoidance, so if you need somewhere to start, the lonely Clam may not be such a bad idea!